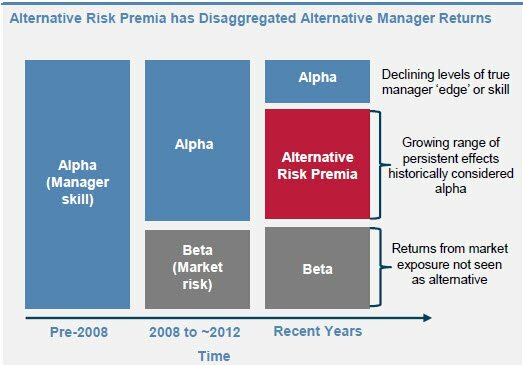 Alternative Risk Premia: A Hedge Fund Alternative? One of the most striking changes affecting the hedge fund industry in recent years has been the rise in popularity of so-called Alternative Risk Premia investing. This relatively new concept seems to be here to stay: it has undoubtedly captured the interest of both investors and managers who have approached it from a range of different angles. On the investor side, a significant and growing amount of capital is being allocated to the space to fill a number of different roles in a portfolio. Some investors view Alternative Risk Premia as a way to get exposure to factors they previously would have accessed through a traditional hedge fund portfolio. In this way, the concept of Alternative Risk Premia is disrupting the traditional hedge fund industry: investors who might be disillusioned with the high fee levels and relatively disappointing returns from their portfolios of 'first generation' hedge funds are seeking to capture the key factors they want from that portfolio in a more transparent and lower-cost fashion. Other investors are using it as a way to enter the alternatives space for the first time and to access diversifying sources of returns for their portfolios, which they previously would not have captured because of reluctance to use traditional 'first generation' hedge funds. In this way, the Alternative Risk Premia concept is helping the hedge fund industry grow by making it more accessible to a wider range of investors. Similarly, on the manager side, a large number of new products are being launched by a wide spectrum of different managers. These managers include traditional large asset managers with backgrounds in long only investing, specialist quantitative hedge fund managers, funds of hedge funds bringing their portfolio construction skills to create funds of individual risk premia and even new startups or new specialist teams operating within larger organisations. The result of this is a further blurring of the distinction between the hedge fund and traditional asset management spaces. Against this backdrop of capital flowing into the space and many different new products being launched, it is not surprising that there is no single, universally accepted definition of the Alternative Risk Premia space - despite very few if any of the underlying strategies actually being new ideas. So what are the different factors to be considered when looking at the space and designing a product? Where should the guidelines and boundaries be set when managers decide what is and isn't suitable for an Alternative Risk Premia product, and how should investors categorise and evaluate the disparate range of offerings? In the remainder of this article we list some of the key considerations and questions which arise, and outline Aspect's philosophy for approaching each of them. Diversification: what do we mean by alternative, and how should exposures to traditional asset classes be managed? Firstly and perhaps least controversially, any Alternative Risk Premia product needs to provide returns that are diversifying or alternative to traditional asset class risk premia if it is to be valuable to an investor as a 'hedge fund replacement'. This normally means that any structural long bias or beta to equities or fixed income is removed. However, in Aspect's view this does not mean the portfolio must be strictly market neutral at all times: several well-known risk premia can only be exploited using directional exposure at times. For example, the trend or momentum premia can generate very diversifying returns by taking directional but dynamic exposures in traditional assets. Insisting on strict portfolio neutrality might mean missing out on some valuable and diversifying sources of return which can only be captured using directional exposures. Justification: what is a risk premium in the first place, how well-known does it need to be and where is the dividing line between alternative risk premia strategies and hedge fund alpha strategies? A literal interpretation of the term risk premium would imply that these are strategies where an investor receives a reward or premium over time for bearing a specific, non-diversifiable risk in the markets. Most suitable strategies therefore have a rational and intuitive justification for why they exist as a structural source of returns. These justifications tend to be rooted in investor behaviour, such as investors' preference for lower volatility assets or the tendency for assets representing better value to outperform. This gives a very broad range of strategies which can be considered, including any strategy which seeks to exploit a clearly identifiable behavioural bias or persistent market anomaly. While most effects are well-known and backed by academic evidence, this need not be a pre-requisite for it to be considered - and indeed this may be a benefit as it may be a less crowded factor. Importantly however, one would need to be confident that if a factor became more widely-known its returns would not immediately disappear. This implies that risk premia factors should be persistent and scalable: most shorter-term strategies requiring faster trading are not suitable candidates, and nor are strategies whose edge lies in having access to data sources which are not widely available. Systematic: do all risk premia strategies need to be entirely rules-based, and to what extent are discretionary overlays or over-rides desirable? In Aspect's view, operating in a systematic fashion is the most reliable way to capture a broad market effect or risk premium which is persistent but intermittent in its operation and may only have a small edge in any individual trade. The disciplined and repeatable nature of a systematic strategy means that a small edge or premium can over time be exploited as efficiently as possible. Of course, operating systematically does not necessarily imply a fully-automated trading process, although in practice the vast majority of markets in an alternative risk premia programme shuold be highly liquid and can be executed automatically. This in turn implies that a manager's skill in execution is a vital part of assessing a product. Research and evolution: should the trading rules and algorithms of a strategy remain static, or is there benefit to be gained from enhancing and evolving the implementation of a particular risk premium? 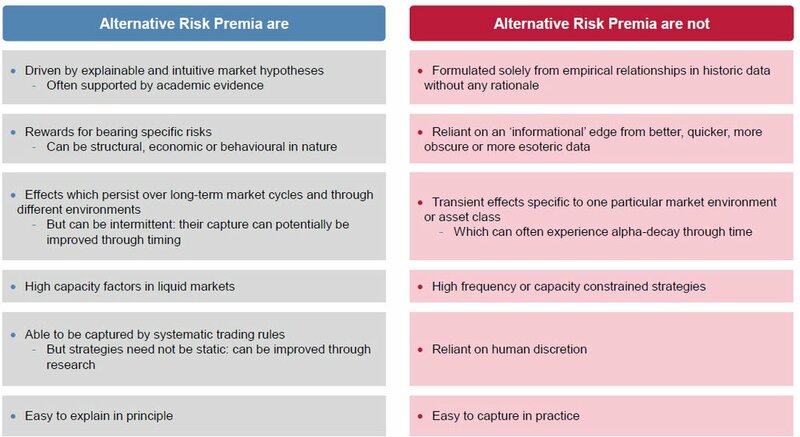 Many of the more commonly-used alternative risk premia are very well documented and are supported by swathes of academic and empirical evidence to support their existence and persistence over very long time horizons. These factors therefore tend to have sets of rules which have become accepted in the academic community as the 'definition' of that risk premium factor. However, a well-structured research process can generate better ways of exploiting the effects and can react as the exact manifestation of a risk premium changes over time. As long as the underlying hypothesis is respected and enhanced versions of a factor remain correlated to the original simple implementation then significantly enhanced returns can be generated from more sophisticated signals and factor construction. This can provide excellent value for the fee-constrained investor. Transparency: should investors expect or even want to see full transparency on the trading rules and systematic methodologies used? One potential benefit to investors of alternative risk premia investing is the ability to access strategies previously associated with traditional hedge funds which provide little or no transparency on their portfolios. And indeed many simpler products make a point of providing full transparency on the design of their models, even to the point of disclosing the "rule book" which would in theory enable the strategy to be replicated. While this may not be practical for more sophisticated strategies, investors should still expect a full understanding of what behaviour to expect from a strategy. This increased provision of transparency is a huge benefit to new investors, giving many the comfort to consider diversifying strategies for the first time. How many: should products focus on providing individual risk premia in a pure form, or multiple different risk premia strategies in a diversified portfolio. This is a matter of investor preference, and in Aspect's view there is a place for both variants. Just as in the traditional hedge fund space in the past, there will be single strategy and multi-strategy products. Some investors may want to focus on particular risk premia factors or construct their own portfolio of individual factors - while still wanting to choose the best possible implementations of those risk premia rather than relying on simplified indices to achieve each exposure. Others want to get the best combination of a diversified range of premia from a single manager, and perhaps in doing so benefit from any skill the manager may have in timing different premia or allocating between them in a more dynamic fashion. Timing / portfolio construction: should managers provide static allocations to risk factors or is there value to be added from timing exposure to an individual factor or having a very dynamic portfolio construction process to shift allocations between different premia in a multi-risk premia product? All risk premia are by their very nature intermittent in their performance and have a certain level of volatility in that performance. As suggested by the name, there are times when a risk premium strategy will be earning that premium and times when the risk will dominate. So in principle if a systematic timing mechanism can be devised whereby the premium can be earnt in the good periods but the risk can be minimised or avoided at the appropriate times then this would improve overall returns significantly and would also be completely consistent with the principles of exploiting these market effects as efficiently as possible. In practice this is hard to do successfully: robust portfolio construction is definitely an area of differentiation between different risk premia products. In summary, Alternative Risk Premia investing is here to stay. Its existence raises the threshold for traditional hedge funds to demonstrate they are providing value for their comparatively higher fees. But it also gives investors more opportunities to access diversifying returns and the skills and experience of hedge fund managers at a reasonable cost. The vast range of different risk premia strategies and implementation approaches implies that performance dispersion in the space will be very high, and therefore that manager selection will be critical.